Please find below the link to our staff wish list. If you would like to donate, please follow the instructions given at the top of the document. Please sign up for “Give as you Live”— an online scheme for Registered Charites, whereby online retailers pay, a % donation to a Charity of your choice at no cost to you, and no cost to the Charity. 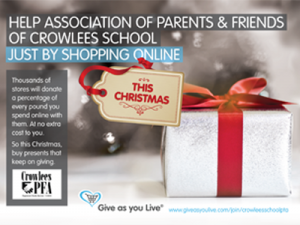 We currently have 115 people registered as Crowlees PFA Supporters and urge all parents to sign up and start contributing to Crowlees PFA— go to www.giveasyoulive.com, register your email address and select Crowlees PFA as your cause and download the App which loads a “pop up” on screen. Crowlees School PFA was formed in 1993 with the specific aim of furthering the interests of children at Crowlees by promoting an atmosphere of co-operation between parents and the school. With the support of parents we are able to raise a considerable amount of money each year. These funds are then spent on a variety of items and/or projects identified by the school. We run a number of events throughout each school year. Some are designed mainly to raise money, some are aimed at the children and some provide opportunities for the parents to socialise and get to know each other. The main fundraising event is the annual Christmas Fair which is usually held on the last Saturday afternoon in November. We hold a school disco for the children each year and fund the Year 6 leavers’ disco. We organise several family fun events throughout the year, such as film nights, magic shows, fashion shows, race nights, barbeque night, beach party and Halloween spooky trail. We run a cake stall at Sports Day each July. All the money you help to raise is donated directly back to the school. Every year we fund the children’s Christmas parties and buy presents and we meet the cost of the Year 6 Leavers’ Disco. Every parent of a child at Crowlees School is automatically considered to be part of the PFA. Although the association is open to everyone, we particularly like to see the parents of the younger children at our meetings so that we can continue to grow and benefit the school in future years. Every year we lose members as their children leave Crowlees and move on to local secondary schools. It is extremely important to us that “new” parents get involved. Our meetings last about an hour every 2 months or so. We are aware that everybody leads busy lives and have many demands upon their time, and for that reason we strive to keep our meetings brief and very informal. Of course, legally, we do have to have Officers (Chair, Vice-chair, Secretary and Treasurer) and these are elected annually at our AGM in September. Help US to Help YOUR kids! Get involved with Crowlees PFA. Crowlees PFA became a charity on 9th February 2012, which enables us to claim gift aid from tax payers on any donations made to school. Current Trustees are Mrs Odelle Hewitt, Mrs Heidi Smith and Mrs Kerry Widgery.